The data feed for companies in the promotional products industry with their own webshop. We have the solution for you. Take a subscription on our XML data feed and you have the most up-to-date product information. The more than 120 affiliated suppliers change their product assortment regularly and with your subscription on our XML data feed you are sure that your webshop is always up-to-date. 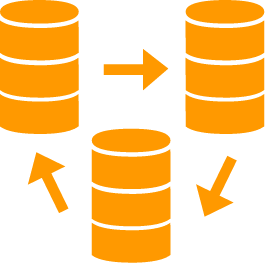 With the Promotional XML Data subscription you have access to over 300,000 sku’s, including product descriptions, images, prices, volume discounts and inventory information. If you have your own webshop, you want to fill that webshop with current and acurate product information. With a subscription on ‘Promotional XML Data’ you get access to very rich product information. You will receive the same extensive product information that we also use in our professional Magento webshops. Via Promidata Portal you can select the suppliers products of your choice in order to publish it to your webshop. 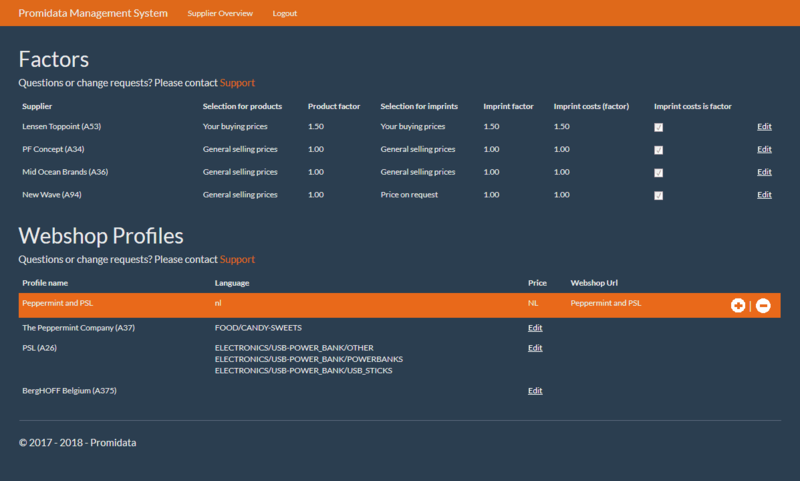 You can even set your own margins and / or discounts per supplier to set your real sales prices. 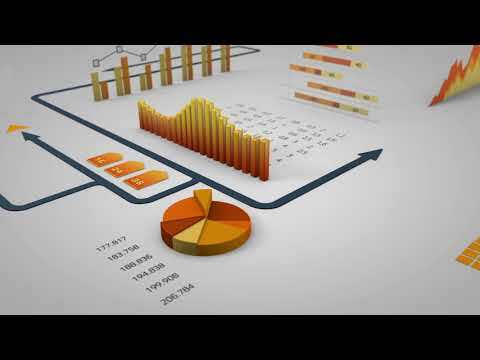 You will also receive a Promidata Portal account together your Promotional XML Data subscription. In Promidata Portal you can decide for yourself from which suppliers you want to receive the products in your XML data feed. Per supplier you can even determine which product groups you want to turn on or off. Per supplier you can see whether the product prices are purchase prices or sales prices. Depending on the type of prices, you can increase those prices by a margin or decrease them by a discount factor. You can use the editing information provided by the supplier, but you can also link your own editing options to the products of a supplier. It is also possible to add your own products to this system, you will then become an exclusive supplier for only these products. This product information will of course never be shared with other users within Promidata Portal. This gives you the opportunity to distinguish yourself from your competition by offering a unique product assortment. If all the margins or discount factors of the product prices of your suppliers are set, then you will see those prices actually appearing in your XML data feed. It is the intention that you link this xml-feed directly to your webshop. From that moment on your webshop will always be up-to-date because the newest product updates will be automatically synchronised by Promidata Portal. The product assortment must be accurate and must be deliverable when a distributor receives an order via a webshop. These requirements guarantee that you can offer your customers real quality from your own webshop. If you want to know more about this rich product information and about Promotional XML Data plan, please contact our sales department directly, Tel: + 31-40-7440800. There are 3 different versions of the Promotional XML Data Feeds. Version 1 and version 2 (the simple versions) can be downloaded via Promidata Portal. Version 3.0 (the rich data version) is the most comprehensive and the most professional version that Promidata currently provides. This data feed is also used in all our Magento Webshops. You can download a demo example of XML Version 3.0 below. This example contains information from only one supplier. 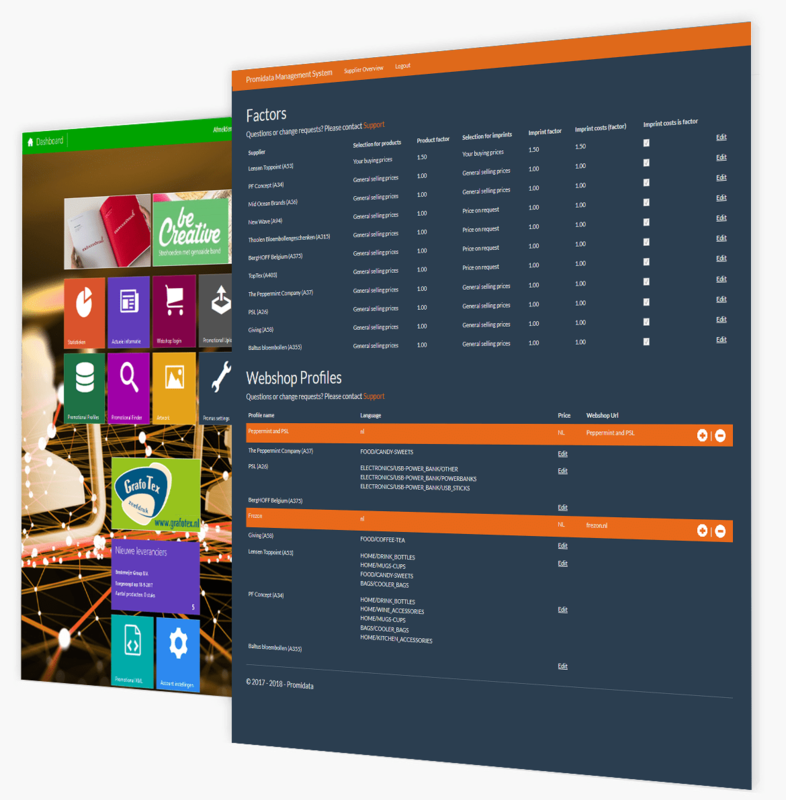 If you subscribe to the XML Version 3.0, you will of course receive all product SKUs from affiliated all suppliers who you have selected via Promas. The demo you download below is compressed in a rar file. You can also use the additional XML data feed “Sponsored products”. Within Promidata Portal, the supplier can select a number of interesting products and bring them into the limelight. With this extra XML data feed you can also present these products fully automatically from your website.